Archie Roach is an Australian singer, songwriter and guitarist who survived a turbulent upbringing to develop into a powerful voice for Indigenous Australians, a storyteller in the tradition of his ancestors, and a nationally popular and respected artist. Roach’s debut solo album Charcoal Lane was released in 1990. It featured the song “Took the Children Away”, which was added to the National Film and Sound Archive’s Sounds of Australia registry in 2013. Also in 2013 he won a Deadly Award for Lifetime Contribution to Healing the Stolen Generations as well as for Album of the Year. Along with fellow Deadly winner Pat O’Shane, he called for an end to the Northern Territory Intervention. In 2015 Roach announced the release of a remastered edition of his classic debut album Charcoal Lane, to celebrate its 25th Anniversary. The release was accompanied by a national tour in November and December 2015. 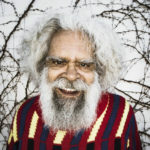 Uncle Jack Charles is an actor, musician, potter and gifted performer, but in his 73 years he has also been homeless, a heroin addict, a thief and a regular in Victoria’s prisons. A member of the Stolen Generation, Jack has spent his life in between acting gigs, caught in the addiction/crime/doing time cycle. Today — no longer caught in the cycle — he lives to tell the extraordinary tale. Acknowledged as the grandfather of Aboriginal theatre in Australia, Uncle Jack co-founded the first Aboriginal theatre company Nindethana in 1972. His acting career spans over six decades. Uncle Jack was the subject of Amiel Courtin-Wilson’s award-winning documentary Bastardy, and was awarded the prestigious Tudawali Award at the Message Sticks Festival in 2009, honouring his lifetime contribution to Indigenous media. He was also recipient of a Green Room Lifetime Achievement Award in 2014. Uncle Jack made headlines in October last year when he was refused a taxi unless he paid the fare upfront, just moments after he was named Victorian Senior Australian of the Year for 2016.